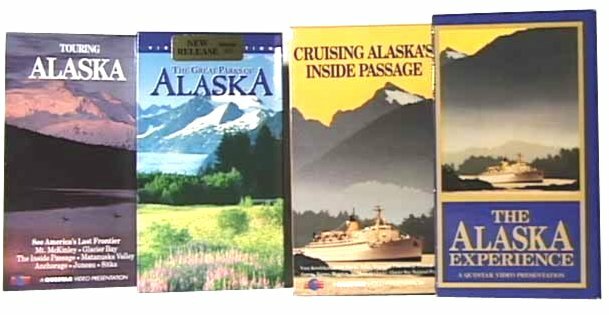 A most comprehensive overview of Alaska's history, culture, wildlife, and scenic beauty are depicted in this handsome 3 volume collection. VHS -- 3 Volume Set -- 210 min total .....NA -- An exceptional value! This fascinating video captures the uniqueness of Alaska, from the wilderness of the great parks, to the life of the people in the cities and countryside. Cruise up the Inside Passage and visit the colorful coastal towns of Southeastern Alaska. Explore Glacier Bay's tremendous fjords and glaciers. Ride the Alaska Railroad from Fairbanks and see Denali National Park (Mt. McKinley), the Matanuska Valley, and Anchorage. Travel to the remote Eskimo lands in the Far North. Other wonders of Alaska included are Ketchikan, Juneau, Sitka, Skagway, Homer, Katmai National Park, Kotzebue, Gates of the Arctic National Park, the sternwheeler "Discovery", Alaskaland and Earthquake Park. BONUS DOUBLE FEATURE! -- This video also includes the National Parks Service Film, "Denali Wilderness", featuring the wildlife in Denali National Park. At Sitka, the New Archangel Dancers breath life into the former capital of Russian America. The Far North is home of the Eskimo and four Arctic Parklands: Noatak, Gates of the Arctic, Kobuk Valley, and Bering Land Bridge. Eskimo people hunt and fish this rugged beautiful land as they have for thousands of years. Southwestern Alaskan Parks sparkle with diversity: from the rich volcanic history of Katmai and Aniakchak, to the watery beauty of Lake Clark and Kenai Fjords. Brown bears feast in rivers filled with salmon. Alaska's Interior hosts two very different parks: Denali with Mt. McKinley, North America's tallest peak, and a lowland park, Yukon-Charley Rivers. The Southeastern Panhandle in Alaska boasts massive fjords in Glacier Bay and Misty Fjord, and a magnificent mountain kingdom, Wrangell-St. Elias, the size of six Yellowstones. Historical parks tell of Alaska's colorful past at Klondike Gold Rush and Sitka, where in 1804 Tlingit Indians fought Russian colonization. These huge parks protect bear, wolves, caribou, musk-ox and an abundance of sea mammals. Alaskan parks are a wilderness treasure of unrivaled majesty. ----- EMERALD CITY AWARDS -- GOLD AWARD OF EXCELLENCE by the Seattle Chapter of the International Television Association. This annual event recognizes "excellence in Non-Broadcast Video and Film Production". ----- COMMUNICATOR AWARDS -- CRYSTAL AWARD OF EXCELLENCE. The Communicator Awards is an organization which recognizes "outstanding work which exceeds a high standard of excellence, and whose work serves as a benchmark for the industry".The CRYSTAL AWARD OF EXCELLENCE is presented to those whose "ability to communicate elevates them above the best in the field".